June 5, 2017, 2:58 PM · Six Flags surprised a lot of theme park fans when it opened Justice League: Battle for Metropolis at Six Flags Over Texas in 2015. 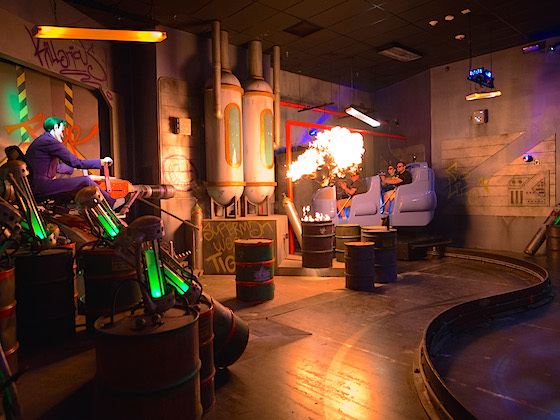 An interactive dark ride featuring ride vehicles from Oceaneering and creative design from Sally Corporation, Justice League felt much more like an attraction one might find at a Disney or Universal park than what fans had come to expect from the roller coaster-heavy Six Flags chain. The ride won our 2015 Theme Park Insider Award for Best New Attraction that year, and Six Flags followed up by installing the ride at its parks in St. Louis, Mexico, Chicago, and Georgia. 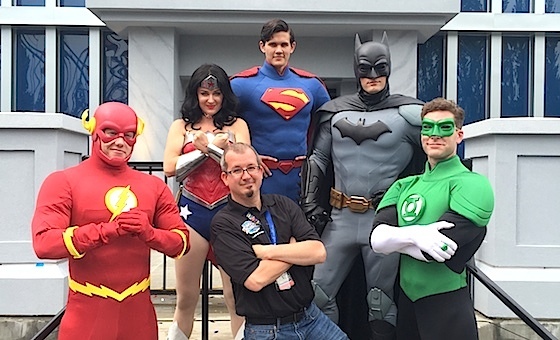 Another installation is coming at Six Flags Great Adventure in New Jersey this month, followed by the final — and plussed — installation after that at my home Six Flags park, Magic Mountain, in Valencia, Calif.
To learn more about what's in store for this final installation of Justice League, I swapped emails with Rich Hill, Creative Director for Sally Corporation, who led the design team for the Justice League ride. Justice League Battle for Metropolis won our Theme Park Insider Award for Best New Attraction when it opened at Six Flags Over Texas in 2015. So a lot of fans thought it was a great ride. Why mess with that formula for the Magic Mountain installation? Nice to talk with you, Robert! And thanks again for honoring our ride with such a coveted award. That was a first for Sally Corporation and Six Flags and the gesture really meant a lot to our entire team. As far as upgrading the ride experience from the Texas to Magic Mountain rides, I really need to take you through the entire process covering the past three years. We consider the Justice League dark rides we created for Six Flags Over Texas and St Louis in 2015 the "first generation" in the evolution of the attraction. Those first generation rides were shoehorned into existing buildings that limited the ride design and caused lots of headaches for the construction teams. They worked well but they had to be hammered into shape and along the way there were compromises we had to make to the original vision of the ride. When we were asked to build five more JL rides over the following two years at SF Mexico, SF Great America, SF Over Georgia, SF Great Adventure and Magic Mountain, naturally, we looked at ways in which we could improve the formula. With these "second generation" Justice League dark rides, we were able to convince Six Flags to purchase brand new buildings designed to our specifications. This allowed for a slightly better guest experience (due to an optimized ride layout) and a more streamlined construction effort. As we’ve duplicated the ride, we’ve continued to make improvements to the ride vehicles, animatronics, interactive gaming, media, special effects…pretty much every system has been improved upon to some degree over the past couple of years. We’ve also gone back and applied many of those improvements to the original two dark rides so they would benefit as well. For this new Magic Mountain ride, we’ve taken those "second generation" improvements and plussed them even more. Because of Magic Mountain’s proximity to other popular dark rides, Six Flags asked us to make this "the biggest, baddest Justice League yet" we jumped all over it by trying some new ideas we’ve been developing that we knew could enhance an already great ride. What's changing in the Magic Mountain installation? Is anything going away from the previous installations? What's being added? While Six Flags is asking us to keep some things a secret until the ride opens, I can tell you that the new Magic Mountain dark ride has a few new tricks in it that you will not want to miss. We’ve totally reworked the pre-ride show to be more engaging…it really is unlike anything you’ve seen in a dark ride before. Inside the ride, we’ve added interactive projection mapping, some really cool interactive animatronics and show action elements, we’ve expanded the practical sets and scenery and created a few new digital effects that should get some big reactions from riders. In the Magic Mountain version of the ride, we’ve also decided to enhance the villain’s side of the battle by adding DC Comic’s most dastardly diva…Harley Quinn! We tried to pull out every trick in Sally’s "dark ride toolbox" to make this a ride like no other! What have you learned along with Six Flags after two years of operation for this ride that influenced this year's installations? During the initial design stage here at Sally, we understood that these dark rides were primarily going into some of the most "coaster heavy" parks in the country and their team might not be accustomed to maintaining and operating highly technical dark rides. That meant one of our top priorities was to design it to be as maintenance-friendly as possible, giving Six Flags the best chance for success. Over the past couple of years of operations, Sally’s excellent Customer Service team has kept in close contact with all of the parks, making sure any issues that come up are dealt with quickly to keep throughput and customer satisfaction as high as possible. We’ve taken everything we’ve learned and applied it to the new rides to ensure they are as easy to keep up with as any other ride in the park. A consistent guest experience in a dark ride is so important and thankfully, Six Flags understands that maintenance is the key to that. When designing an interactive ride, how do you find the right balance in the gameplay so that it engages a devoted gamer while remaining accessible to someone who never plays games? Non-gamers tend to focus on the shooting and scoring being fun and accurate. They don’t necessarily need to get the high score, they just expect that when you blast something in a scene, there is a big reaction that is cool to look at and gives them satisfying haptic feedback (sound, movement, light). The ride is a ton of fun even if you aren’t blasting bad guys! For the gamers out there (I’m one of them), we focus on the depth of the game by unlocking puzzles and layering targets so players are always finding new ways to score. The game needs to be deep enough to support years of playing it over and over, so discovery of hidden easter-eggs is something we try to include and keep updating. Being able to change aspects of the game whenever the park requests it is a big surprise for fans of the ride. What was a high scoring, bonus target today might not be when you ride it tomorrow! Justice League uses screens, but there's a lot in the attraction that's not traditionally screen based. How did you decided what media to use where in the ride to create this experience? When I design a dark ride, I use whatever artistic medium works best to tell the story. For example, when we chase the Joker into STAR Labs and are attacked by him riding a Laughing Gas Cannon. That effect couldn’t have been done on a screen because I wanted Joker to actually touch the guests at that point, invading their personal space (with a blast of laughing gas, of course!). As good as our projected 3D is…it just can’t invade our space like something practical can. On the other hand, the big chase scenes would have been impossible to make it happen with practical sets and scenery. When we’re chasing the Joker and Lex Luthor at 100 miles an hour through the streets and subway tunnels of Metropolis, blasting flying LexBots, flipping upside down and doing barrel rolls, that kind of action just can’t happen practically without addressing some major safety concerns! Overall, a balanced mix of practical and virtual elements is a great way to keep guests on the edge of their seats. You want them to be surprised by the wide variety of ways you are delivering the story to them. It gets to be boring seeing the same 16:9 landscape screen used over and over again…at least for me. Throwing some surprises in there really helps keep the guests attention. On board the Justice League ride. Photo courtesy Sally Corporation. Did you have much contact with DC in developing Justice League? What was their role in helping to define the characters and narrative for the ride? The DC Comics Justice League super heroes are some of the most popular characters in the world. Most of them have been around for over 75 years now! I feel extremely lucky to have been given the chance to write stories using them as my cast of characters. Bucket list…check! 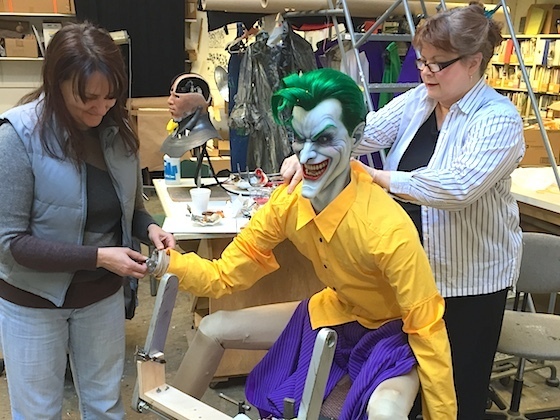 Yes, we have meetings with Six Flags, Warner Bros. and DC Entertainment to review all new ride elements, making sure everything is on-brand and approved. They are a joy to work with because they really care about how their brand is portrayed and appreciate when the characters are used correctly and effectively. Initially, Sally Corporation worked directly with Six Flags to develop the story. Les Hudson and Sam Rhodes (Six Flags corporate design team) helped guide me as I wrote the concept narrative. They asked us to deliver a thrilling Six Flags experience for their guests that could compete with their biggest coasters. Once that concept narrative was approved by Six Flags, we presented it to WB and DC, getting their approval. As I wrote the script, Six Flags, Warner Bros. and DC would review every couple of weeks, giving me notes. I think we went through 7 drafts in about 3 months. Once the script was approved, I started designing the ride building, track layout, vehicles and interactive blasters. Once we got initial approval on all of those, I unleashed our super-talented team of designers on it. They are the real super heroes because they turned my chicken scratch into workable reality. The JL design team includes: (Sally Ride Design) Sherrie McRee, Bill Kivi, Alex Gutorov, and Hal Hackendale (Wyatt Design Group) Larry Wyatt, Mark Shumate, Meg Cunningham, Jason McManus and (freelance) Rex Moon. This was about as close as you can get to a dream design job and the entire team put all of their effort into it. The project has been a lot of fun and, as you know Robert, the results have been just, well…SUPER! Finally, let's give a little help for the gamers out there. What's your number-one favorite, not-obvious tip for increasing your score on the ride? I don’t want to give too much away (discovery is part of the fun!) but you might want to pay particular attention to the following areas: the Security Panel that Cyborg is breaking into outside of the LexCorp building, the Computer Monitors in front of the Containment Units inside LexCorp, and Joker’s Henchmen in the Subway Tunnel. Also... watch your score closely. You’ll know when you hit the Super Bonus Target when your score jumps 6,666 points (get it? ...for SIX Flags)! June 5, 2017 at 7:31 PM · Thanks for the Feature. Currently traveling to Vallejo where I will be 2 days, followed by each 1 day San Jose and Gilroy I will hit MM June 10/11. Will it be already open? June 5, 2017 at 9:37 PM · Man I am so stocked for this ride at SFMM! Is there an official opening date? June 6, 2017 at 7:02 AM · SFGAdve has been surprisingly silent about when their version of the ride will be opening. We'll be up there next Sunday, but it looks like it still won't be ready. I was quite surprised that the SFGAdv was being installed in a new building (not the old simulator building by 2 already existing Justice League branded rides - Green Lantern and Superman: Ultimate Flight), though I can understand some of the difficulties the team had squeezing the new attraction into an old building - quite a jigsaw puzzle not only fitting the attraction layout but also building it in an existing structure with support beams and columns that erection equipment may have difficulty maneuvering around. The SFMM version has been touted as a plussed version of the originals, but with the SFGAdv version also being installed in a new custom building, was there a reason the east coast park did not get an expanded version of the attraction? June 6, 2017 at 10:12 AM · I too am curious when the SFGAdv version will open Russell. There seems to be zero information available online about it other than "Coming in 2017". I am hoping to take a ride down there from Long Island once it opens. Would like to experience the safari attraction as well. If anyone who visits regularly has any additional information, please share. June 6, 2017 at 12:27 PM · Thanks for the heads up Bobbie. We'll be there on Sunday, June 18th, so perhaps it will either be fully operational or at least in season passholder preview mode that day. I know when we tried to make the opening of the Justice League attraction at Six Flags St. Louis a couple of years ago, we ended up circling back to the park after a week in Chicago before flying home for a quick "drop in" just so we could ride it because it wasn't quite ready during the first few days of our 11-day Midwest trip. June 6, 2017 at 9:40 PM · Great article! Love the talk on how it developed and all, very cool ride to capture the comics well. June 7, 2017 at 5:04 AM · Well my Trip is 90 days, but I will for sure not circle back to CA from Ohio, PA or NY just for that ride, that I know already from Texas 1. Version in Opening Season (been their in November 15 for first day of Holiday in the Park). Why not circling back? That would eleminate an other Park on my Trip and a Greyhound Ticket that costs 99$ in a 21day-pre-sale cost 227 spontanously... No way for a few new features..
June 7, 2017 at 11:00 AM · June 15th & 16th for Passholder's, the Public on the 17th. That is the Official Dates. June 8, 2017 at 8:42 AM · For MM? June 12, 2017 at 2:13 PM · Outstanding article; awesome looking attraction. Wish we had one in Orlando.